Does Mulch Draw Termites? Should I Keep It Away From My Foundation? To be on the safe side, you can leave a 1-foot-wide swath of ground mulch-free all along your foundation (and keep the ground here as dry as you can). Outside of this "mulch-free zone," you may apply mulch (as people often do to suppress weeds in their foundation plantings), but limit its depth to just a few inches and inspect it vigilantly for termites. Now that you have the short answer, let's explore this issue in greater depth. 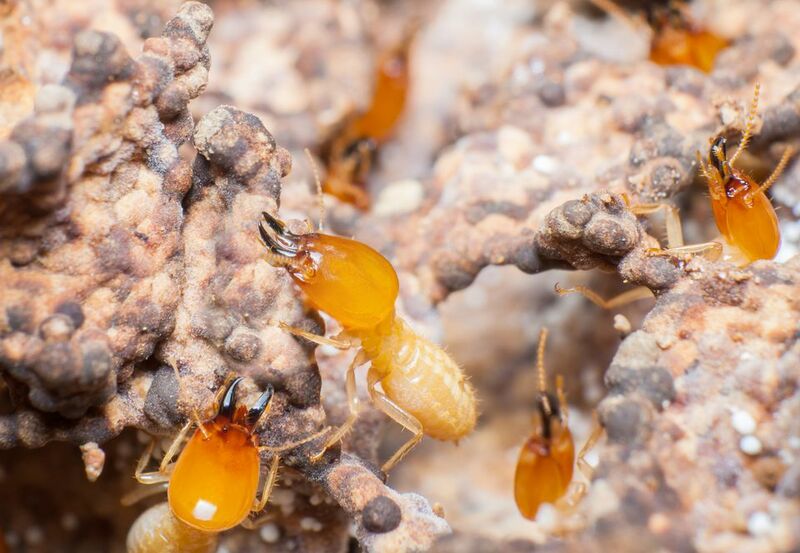 Termites are known to be a concern in your area. You, yourself have had trouble with termite pests in the past. The very word, "termites" is enough to make one shudder, and with good reason. That is why it may be best to play it safe and err on the side of caution when mulching near your home's foundation. Drainage and termite control are two matters to keep on the front burner when applying mulch to a foundation planting. Ensuring adequate drainage is relatively simple: Grade the ground underneath so that it has about a 5-percent slope away from the house, to channel water away from the foundation. But termite-control recommendations are more complex. Can I Mulch Around My House, or Will This Draw Termites? Should the mulch be allowed to come into contact with the foundation? How deep a layer of mulch is acceptable? And how close should the mulch be allowed to come to a wooden surface? Are some types of mulch preferable when it comes to termite control? Does a wood mulch actually draw these pests to a yard, in search of a snack? Each of these termite-control questions deserves individual treatment. There is some disagreement over the answer to the first question above. Some advise against letting the mulch come into contact with the foundation at all (you certainly should not allow such contact if a termiticide was applied to the soil along the foundation when your house was built). In other cases, if you want to err on the side of caution for termite control (and it is hard to fault a homeowner whose general policy is, "Better safe than sorry"), then this would be the correct answer for you. As mentioned above, simply keep your bed of mulch a foot or more away from the house (if this mulch-free zone allows you to sleep better at night, then it is a precious foot of space, indeed). If you are going to be a bit less paranoid and will let the mulch come into contact with the foundation, then limit the depth of the layer of mulch to about two inches (in fact, even if kept further away from the house, a mulch layer in a foundation bed should not be much deeper than this, with four inches being maximum depth). But how close should the mulch be allowed to come to a wooden surface? Burnett's Landscaping in Salem, Connecticut (U.S.) recommends "at least eight inches of exposed foundation between the top of the planting bed and the wood sill plate of the house structure." Finally, when it comes to the best type of mulch to use when termite control is a concern, there is a widespread misconception. Folks assume that, because termites eat wood, only wood mulches present a problem. That is a myth. There is also the separate question of whether, technically speaking, mulch actually draws termites to your land. The issue is not termites being drawn to a property by the promise of a wood mulch that they can eat, but rather termites that are already present (in the soil) exploiting the mulch as a hiding place, using it as a launching pad to invade your house. Termites like moisture, and all mulches provide that to some degree. In fact, good moisture-retention is one of the prerequisites for the most effective mulches. Your plants enjoy this quality in a mulch, but so do the termites. And remember, even mulches that retain less moisture (such as stone mulches) still furnish pests with a place to hide. To sum up, the case is not so much that mulch draws termites to a property (they were probably there already), as it is that mulch makes life more comfortable for these pests. And placing mulch near the foundation, specifically, just invites them to rise up out of the soil and search for ways to penetrate your house's walls. And who needs that, right? Incidentally, it is more accurate to say that termites eat cellulose than to say that they eat wood. Cellulose can be found in the cell walls of plants (not just trees). Consequently, termites give you another reason not to like them: They can damage your landscape plants. So what is a homeowner worried about termite control to do? First of all, if you do not already know, find out what the heck a termite looks like, anyway, using the termite picture above for identification. Next, be diligent and inspect the mulch in foundation plantings regularly, to determine if any termites are present. If you find any, do not procrastinate: Contact a reputable professional in the termite-control business immediately. What's a French Drain, and How Can You Install One in Your Yard?